It was an incredibly moving weekend with the superb world music ensemble Journey West. 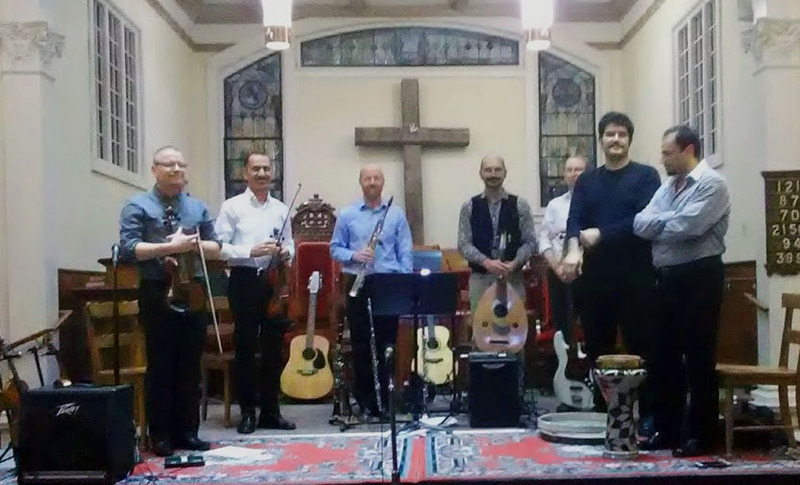 Spending time together, learning about personal histories of band members from the Middle East, and experiencing their wonderful music was shocking, touching, and ultimately uplifting. Seven guys on violins, saxophone, clarinet, flute, penny whistle, mandolin, guitar, oud, bass, accordion, and all manner of percussion took the audience on an exotic voyage, performing music from the Middle East, Balkans, Eastern Europe, Western Europe, and ultimately arriving in North America. It was particularly meaningful, in that these concerts were for the benefit of Plattsburgh Cares, a nonprofit organization providing humanitarian aid for asylum seekers and refugees traveling through our community on their way to Canada, and UNHCN, the United Nations Refugee Fund. Two excellent concerts were well attended and $3000± was made for the good cause.